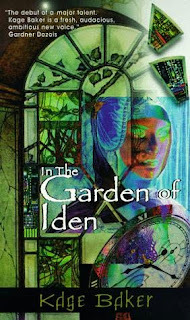 In the Garden of Iden is the start to Kage Baker's long running time travel series The Company and was also her debut novel. Before I started In the Garden of Iden all I knew was that it played with the ideas of time travel, immortality, and involved some sort of company as the series name blatantly implies. After reading I can certainly understand why Baker has won numerous awards and has a strong following for the series. In the Garden of Iden is witty and and surprisingly engaging. The main character, Mendoza, is taken into the Company after almost perishing as a child during the Spanish Inquisition. Baker does a good job of showing how people lived during the time and how the Inquisition was viewed and acted. However, the back story is what really caught me with the idea of Dr. Zeus, who is sort of like the Moses/Einstein of the future, orchestrating events to his benefit. There were also other plot threads opened up such as cyborg Neanderthals that have been around a long time that I'd love to hear more about and is apparently something discussed in later books. The characters are a bit flat at times as are their motivations. Mendoza especially comes off emotionless, but all of sudden is taken by a influx of emotions which seem out of character. These misgivings could be explained away by the fact that Menzoda is an technology altered woman who has been given a lot of knowledge about the future, but still it bothers me. The pacing is also a little slow especially around the middle during the romance part of the story, which I didn't care too much for, but I have a feeling this may be a recurring theme in later books. Overall, In the Garden of Iden has some great mythology building with some character issues, but it is still an enjoyable and quick read. I give In the Garden of Iden 7.5 out of 10 Hats. I'm intrigued enough to try the next volume, Sky Coyote, as I want to learn more about The Company and Mendoza's future. I'm also curious as to whether all the books center on Mendoza. If their are any fans feel free to comment. This was Baker's debut effort and I am hopeful it gets better from here. 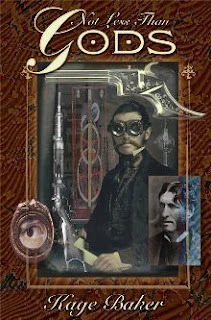 Baker also has a sort of prequel series that has elements of Steampunk coming out early next year titled Not Less Than Gods, which so far sounds interesting and I intend to give a read. The cover above is the Sub Press limited edition coming out by the end of the year although the trade hardcover won't be out until March 2010 from Tor. Nice reading choice. Feels like an awesome book. I usually can overlook characters in favour of interesting mythology, so this can be the right kind of read. I liked to get more information about this series. Since I discovered it last year over at FantasticFiction. And I recommend to visit Kage's page where you find more information about the series and excerpts.